Once I went to a well known busy shop and invited the business owner to come and visit the temple. And, he said things like, Oh, I am so busy with my work. Everyday, I am here from morning to evening looking after the business and I hardly get time to come to the temple. I wondered, what would be the fate of this man. No doubt, he will grow in his business, make more profits etc. but, what about his personal and then spiritual life?. Anyway, I am not passing any judgements and wishing anything bad for this guy. Everyone has their fate and destiny and one reaps the fruits of his actions, but I was reminded of a Verse from Bhagavad Gita Ch 4:11 and a story I heard some time ago. All of them-as they surrender unto Me-I reward accordingly. Everyone follows My path in all respects, O son of Prtha". You walk one step closer to God and he will walk 100 steps towards you. One time, Lord Krishna and Arjuna went on a touring expedition of their kingdom.As the sun started going down, they decided to take rest for the night in a remote place.They visited the small house owned by a pious old lady.The lady was a great devotee of Krishna and she was ecstatic and happy to recieve both of them.She is old, poor, widow and had nothing much to serve them.The only way of her sustnance was a Cow,which was giving ample milk.The old lady took a nice care of both Krishna and Arjuna in every way she could by serving them with nice milk from the cow, showing them a place to sleep etc. Next morning, Krishna and Arjun thanked the pious Woman and continued their journey. Arjuna made a petition to Krishna that, my dear Krishna, I am sure you must have been pleased by the way, the lady took care of us. I request you to reward her accordingly. Lord Krishna said, that’s right. I give a benediction that the Cow passes away. Arjuna was shocked and lost for words but, because he respected the wisdom of Krishna, never spoke a word. The journey continued and the sunset again. This time, Krishna and Arjuna reached the Mansion of a wealthy person and they decided to take rest for the night. The personal servants of the wealthy person received both Krishna and Arjun and went to inform their Master about, their arrival. They came back after a short while and informed, Krishna and Arjun that their Master, had acknowledge their visit and but, is busy to see them. However, they said that, they were advised to be taken care in every possible way and make their stay a pleasant one. The night passed with all the wonderful services provided by the servants and next day morning, it was time to leave. Arjun, little bit hesitantly said to Krishna that to reward the wealthy merchant accordingly. Immediately, Krishna replied that, may the wealth of the person increase many folds and he become richer. Arjun could not take this anymore and said to Krishna – “ My dear Krishna, what kind of justice you are giving to people?. Previously, you pronounced the only Cow of the old lady to be dead, making her helpless and poor. And, now for this arrogant merchant who did not even bother to come and meet us, you are giving more wealth?.” Lord Krishna smiled and replied back to Arjun – “ My dear Arjun, the old lady had very little time left to give up her body and she had all the good qualities and devotion to come back to the spiritual world but, she was too attached to her Cow, which might cause her to take birth again in this material world. The wealthy merchant had too much attachment to his wealth and does not want to give up any of his riches. And, he wanted to avoid seeing me, incase if I ask him for any share of his wealth. So, I have understood his heart and allowed his to go further away from me. 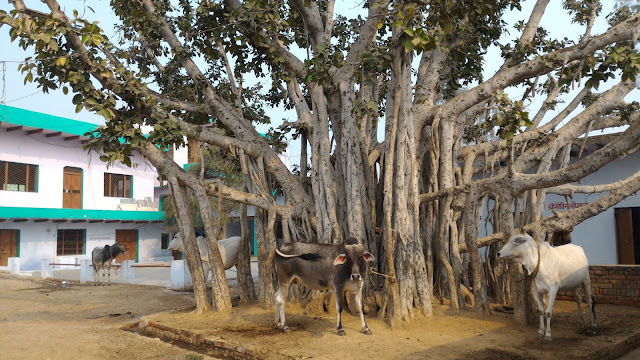 Whereas, the old lady had all the love and devotion towards me and made it easy for her by removing the source of her only attachment – the Cow”. Thus, the Supreme God is fulfilling everyones desires and reciprocating accordingly. For, people who want him to be their Master, friend, Lover, Child – he becomes one. For, some Yogis who want to perceive as the blissful, impersonal light, he is appearing as a light. For other Yoga practitioners, who want to perceive him within their heart as Paramatma or Supersoul, he is fulfilling their accordingly. And, for people who want to forget and go away from him, he is helping them so.